Recently introduced by TK4B Enterprises, LLC. is a newly designed and developed top lever spring especially for those officiadoes in the Classic Cowboy category. The spring is designed merely to replace the stiff, and most times unevenly ground, existing cast spring. Field tests by local TTN shooters over the past several weeks have proven the spring will guarantee a solid lockup and reduce opening pressure significantly. Like most of TK4B products it is manufactured with music wire stock and after forming is heat set to reduce any subsequent set, or reduction in power. Inappropriate installation procedures can destroy or reduce its effectiveness. 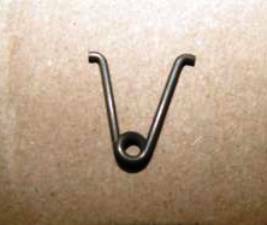 The only critical issue while installing the spring is to be certain that the “LONG” leg of the spring MUST be placed into the detent in the FRAME of the block, then obviously, the short leg attaches into the lever drum detent. Yes, one IS longer! Notice it is on the right side in the above picture. It isn’t that much longer, but it is longer and it has to be against the frame for it to work properly. trademark of TK4B Enterprises, LLC.